Special order, custom or replacement - let us show you Howe! Pine Doors: There are two more common patterns for pine doors: 4 panel (left) and 6 panel (right). 6 panel is by far the most common, especially in the Northeast. It is most commonly associated with a colonial or more traditional look. There are also a few different styles of jamb available, including a split jamb and a solid jamb. Each has its own benefits and difficulties. Flush Doors: A flush door is one that has no panels or other patterns. It is the simplest sort of door that is available ready made. We can get them either prehung, or simply as a "slab" [i.e., just the door, without hinges or jamb, and without a hole bored for a handleset]. Sometimes, the door slabs are used as temporary workbenches (when put on a couple of saw horses), or hung in a rough doorway into a utility closet in the basement, or other rough, temporary light duty. Flush doors, like the colonist doors, are avaliable with either a hollow core or a solid core. The difference between the two lies in the relative solidity and weight you want for the door. The least expensive is the hollow core, which also is pretty good at reducing noise coming through. The solid core is a much sturdier door, and is a bit more expensive. The most common jamb for this style door is a split jamb, as it is the most economical both in terms of time and material. Fiberglass Doors: Thermatru's fiberglass doors give you the appearance of wood without the heat loss. Stain kits are available to give the fiberglass all sorts of different wood tone finishes, and there are many different art glass options available if you want something unique for your main entry door. Colonist Doors: Colonist doors are also commonly called masonite doors. They are made out of masonite (a.k.a. hardboard), which is a sort of compressed paper product. It is lighter than pine, and is also much less costly. There are two basic designs, just like the pine doors. And we can order for you colonist doors that are either "smooth" or with a woodgrain texture. Another option available is solid versus hollow core. Usually these doors are installed as a hollow core, which is both lighter and less expensive. Solid core doors are more substantial feeling, can take a little more abuse, and are more expensive because of the extra material used in their construction. Patio Doors: One of the most common patio doors is the gliding door. It slides to the side, out of the way, yet leaves the outdoors visible through the glass. Often you find a sliding screen door on the outside as well, to allow fresh air inside. Another option is the hinged patio door. It works very much like a standard exterior door, swinging its panels into the room. The full tempered glass allows for much more light to enter the room, and the screen on the outside is an added feature that is most welcome in the warmer months. This screen usually can be either a gliding screen, or also hinged, swinging out, away from the doors. The third major option for patio doors is an outswinging door. The glass panels and the door itself are very similar to the regular style hinged door. The difference lies in the weatherstripping and sill. They are engineered so that rainwater and melting snow do not enter your home. This is a perfect option when the room is too small for a standard hinged door, and there is not enough room for a gliding door. Gliding Windows: Gliding windows are a nice option that allows a good amount of air flow, but without the same old profile of a double hung window, or the crank out pane you get with a casement. Sun rooms or windows that open out onto a deck are likely spots for gliding windows, since there are no grilles or rails in the way of the view, and you don't have to worry about someone walking into the open window outside the house. Bay Window: A bay window is obvious by its relatively boxy appearance. It generally has a single window in the center, flanked by two windows of the same side, at an angle. (The trapezoid at the top is supposed to mimic the profile of the window when you look at it from above.) The flanking windows almost always open. The center window sometimes does, and sometimes does not. In larger windows, this center window may actually be several windows. Casement Windows: A casement window is often also referred to as a "crank out" window. It has a single pane of glass that sits on a pivot point. To open it, you generally must turn a crank, and the window swings out. The screen is on the inside, so that the window may open freely. Often there will be no grilles in the glass, to allow an unobstructed view. 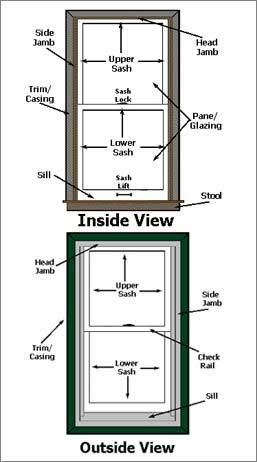 Double Hung Windows: Double hung windows are perhaps the most commonly recognized window. They have two panels, also called sashes, both of which are able to slide. The screen is on the outside, and there are sometimes grilles on one or both of the panes of glass. A recent innovation is the tilt wash window, which means that the sashes can tip inward, to allow for easy cleaning, as well as easy sash replacement. 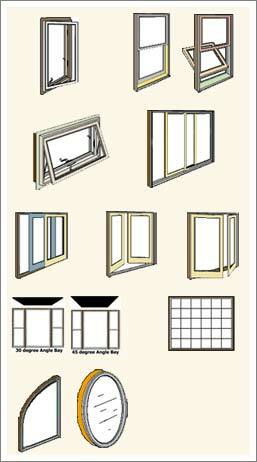 Awning Windows: Awning windows function similarly to casement windows. They use a crank to open, but where the casement opens to the side, an awning window opens from the bottom edge. It turns around an axle that is horizontal, so that you may get air flow without much risk from rain. The screen is on the inside, just like the casement, so that the window pane may open freely. Awning windows are often mounted underneath a picture window, or another awning window, to maximize the view outside. Picture Windows: A picture window is perhaps the simplest sort of window, yet can be the most elegant. It is a simple pane of glass, with the grille as an option. The clear glass allows plenty of light in, and there is little danger of rain leaking in. 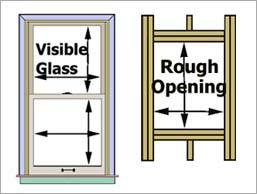 It does not open, so is often seen as a part of a unit alongside either casements or double hung windows. They are also often seen as the center unit in a bay or bow window. Different Shapes: There are all sorts of different shapes that can be custom made to suit your window designs. Ovals, triangles, and trapezoids are only a few of the options. They do take a little extra time to make, of course. The result is often worth the wait, when you look at your own unique design.